The Anchorage Assembly is seeking help to determine once and for all if it really needs to spend roughly $1.9 billion to rebuild the city’s deteriorating port. Assembly member Christopher Constant, who has started a reexamination of the Anchorage Port modernization program as co-chair of the Assembly’s Enterprise and Utility Oversight Committee, summed up reaction to the potential price of the port project at a March 21 Assembly committee meeting. “We need to look closely to figure out if there’s cost savings. Sticker shock doesn’t even get near the level of shock,” Constant said of the $1.9 billion estimate to replace and upgrade the port’s cargo, petroleum, cement terminals and other facilities. Modernizing the Anchorage port — officially renamed the Port of Alaska by the Anchorage Assembly in 2017 to highlight the statewide importance of the city-owned infrastructure — was initially pegged at just less than $500 million in 2014. That cost estimate grew to more than $700 million in 2017 and was updated to approximately $1.9 billion earlier this year. There is no questioning of the need to substantially rehabilitate the Anchorage port, which is the primary hub for goods entering Alaska. Some sections of the pile-supported docks have been in place since 1961 and have far exceeded their initial 35-year design life as the saltwater they stand in has gradually taken its toll and badly corroded the steel support pilings. The Assembly on March 19 unanimously approved spending up to $100,000 from the port’s operating funds to hire experts to evaluate the overall cost of the current plan as well as whether or not the remaining development from the first, failed port project is usable. Constant said the money could be split into two or more contracts to satisfy the economic and engineering aspects of the review. He also noted the Assembly could approve additional funding for the consulting work if $100,000 isn’t enough. The Assembly specifically wants to know why the expected construction costs have nearly quadrupled over five years; ways the work can be modified or sequenced to lower costs; what facilities and equipment long-term port users truly need and are willing to pay for; and what are the best avenues for funding the project, whatever the final price ends up being among other aspects of the project. A key caveat is that any firm hired to perform the consulting work will not be eligible for future work on the large port construction project. CH2M, recently purchased by Jacobs Engineering Group, evaluated the design for the original port expansion project and determined — in addition to problematic construction techniques — the underlying engineering of the proprietary Open Cell Sheet Pile dock design did not meet the challenging seismic stability requirements for the port. CH2M detailed its findings in a lengthy report released in early 2013. Officials in former Mayor Dan Sullivan’s administration then recommended to the Assembly in early 2014 that CH2M lead management of the next iteration of the port overhaul given the company’s knowledge of the situation. The Assembly in 2014 approved CH2M to manage the downsized port modernization project, which calls for using more traditional pile-supported docks. However, some current Assembly members have expressed frustration over the fact that a firm first hired to conduct an independent analysis of the construction issues at the port was subsequently offered additional work based on the findings in its report. A large part of the new consulting work would be evaluating CH2M’s findings. Representatives from PND Engineers Inc., the Anchorage-based company that designed the sheet pile dock, have contended for years that the first port project failed because of faulty construction and not problems with its proprietary dock design that has been installed elsewhere in the state at ports in Kodiak and Dutch Harbor. PND President Jim Campbell told the Assembly committee in late February that he believes two new cargo terminals could be built off of the remaining sheet pile for a little more than $300 million versus the roughly $1.4 billion CH2M estimates it will cost to remove the sheet pile and much of the land behind it before building new cargo terminals. Port officials have generally said increased foreign steel tariffs; building to high seismic criteria with a 75-year working life; the logistical complexities of keeping the port open during construction; and removing much of the 30 acres of fill that created a large area of backlands at the north end of the port during the expansion project have added to the project’s costs. CH2M project manager Jeff Bool said March 21 that any firm hired to analyze the current project should also have experience with federal permitting requirements, specifically those for the National Marine Fisheries Service, as marine mammal protections related to endangered Cook Inlet Beluga whales add significantly to construction costs. With the prospect of state funding uncertain as lawmakers continue grappling with resolving the state’s large budget deficits and federal support unlikely at least until the city’s lawsuit against the federal Maritime Administration over management of the first construction is closed, city officials have said raising import tariffs at the port is one of few remaining ways Anchorage can pay to rebuild the aging docks. The municipality is contemplating increasing fees on fuel and cement to finance the reconstruction of the terminal that handles those goods using revenue bonds. 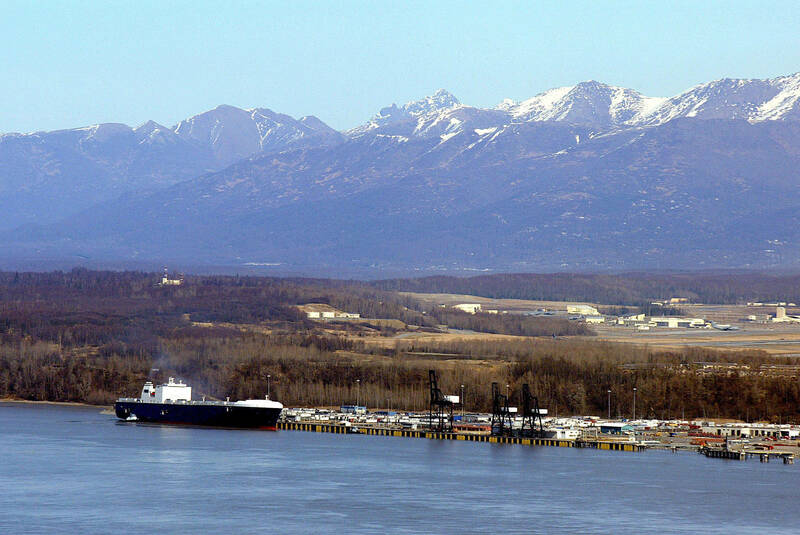 However, the port customers and many other observers worry the five-fold or more tariff increases that would be needed for Anchorage to self-fund the work would drive business away from the port and raise the cost of basic goods such as fuel and groceries to the point that Alaska’s overall economy could suffer as a result.